Long sleeve down-filled quilted nylon coat in black. Detachable hood featuring bungee-style drawstring and press-stud fastening. Hook fastening at stand collar. Double-breasted button closure at front. 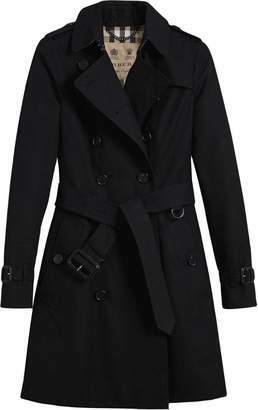 Detachable pin-buckle belt and welt pockets at waist. Pin-buckle cinch strap at cuffs. Fully lined. Silver-tone hardware. Tonal stitching. Fill: 80% Greylag goose down, 20% goose feathers.